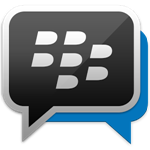 The BBM app might have made a real impact if it had arrived a few years ago, but it's not very impressive in today's Android ecosystem. 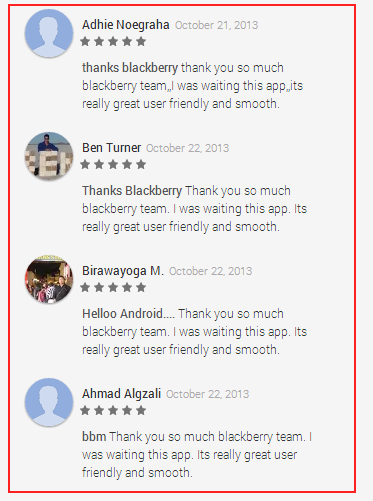 However, the app is currently sitting at a very respectable 4.2 stars in Google Play. Good for BlackBerry, right? Well, maybe not. Starting on the first page there is a strange pattern of mostly 5-star reviews with identical or very similar wording. Something is fishy. 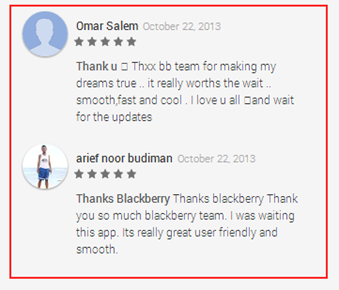 Thank you so much blackberry team. I was waiting this app. Its really great user friendly and smooth. They all have the same mix of elements and broken syntax, but that's probably not the extent of the spam reviews. 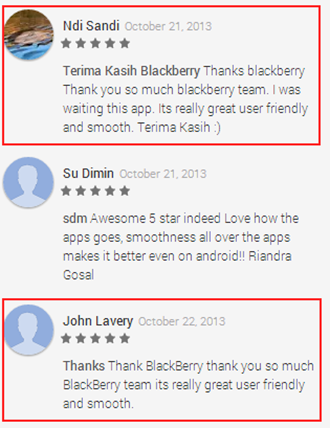 There are also others that use similar elements, referring to the app as smooth or user friendly while thanking BlackBerry. Some AP commenters also noticed the obvious fakes. Not all the positive reviews are fake, but they're at least very suspicious in this context (I'm only highlighting the ones that are clearly the same). We could just be seeing users who were paid to leave reviews and didn't change the suggested text, and other who decided to tweak it a bit. 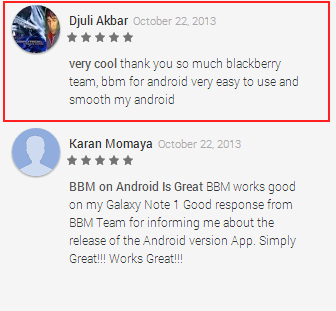 It's clear the BBM reviews are tainted, but it's impossible to know how pervasive the problem is. Only reviews that include text show up as individual entries in Google Play, so there could be (and probably are) a lot more phony reviews pumping up the overall rating than what we're seeing. Furthermore, when you look at the reviews that contain none of these suspicious elements, they're pretty negative. Almost all the users posting these reviews are from India or Indonesia, which could mean someone in BlackBerry's foreign offices got a little over-excited and fired up a Mechanical Turk (or similar tool) campaign to get more positive reviews. I'm not saying I absolutely know it to be a BlackBerry covert op, but who else gains from a successful launch of BBM? It is also worth noting you have to install the app to leave a review, so at least some of those 10 million downloads were paid for. This is a serious violation of the Play Store terms, and this is BlackBerry we're talking about – not some fly-by-night, single-man developer. What a mess. This doesn't really tell us how the reviews came to be there or who was responsible. Hopefully we get a fuller explanation later.